JSS Academy and the constituent colleges continue to expand its innovation driven environment and culture based on technological / medical advances, entrepreneur mind set, and global market conditions, shifting business environment and international collaboration and expectations. The University to drive innovation in the University has established “Center for Innovation and Entrepreneurship (CINE)”. Known as “SPARKLE (Science Promotion through Advancement of Research and Knowledge for quality of Life and Entrepreneurship)” . Starting of Innovative Programs through inter disciplinary approach. Starting of Innovative Academic Programs in Cognitive Sciences, Emergency Medicine, Clinical Pharmacy, Dental Implants , Oncology Pharmacy etc,. Establishment of inter professional education classes. Introduction of OSCE (Objective Structured Clinical Evaluation) and OSPE (Objective Structured Practical Evaluation). Flipped class room and bring you own device (BYOD) models of teaching and learning. The University has established a center for continuous learning and professional education (CCLPE) to support the colleges in learning and pedagogical innovation. With the support of this center colleges have introduced innovation for supporting education technology and learning resources which include massive open online courses (MOOC), Flipped Class room, Bring Your Own Devices, Dynamic Assessment and Learning through Events Evidences and Narration besides Mind mapping, Flashcards and Quizlets are employed. The Seminars, Internships, Field trainings and Projects are the part of teaching and learning process and are well supported by the University. The University has signed Strategic MoU with Industries, Research organizations and Universities to realize the same.Simulations and simulation labs support greatly the experiential learning. Translational and Transformational Research that benefits the society. Centre of Excellence in Molecular Biology and Regenerative Medicine in driving research at Molecular level leading to stem cell therapies and the like. Centre for Clinical Research Excellence driving research in the development of new medicines through human trials. Centre of Relevance and Excellence in Herbal Drugs driving new drug discovery. National Center for Pharmacovigilance driving concerns regarding Patients Safety and Adverse Drug Reactions. ICT integrated teaching and learning process. 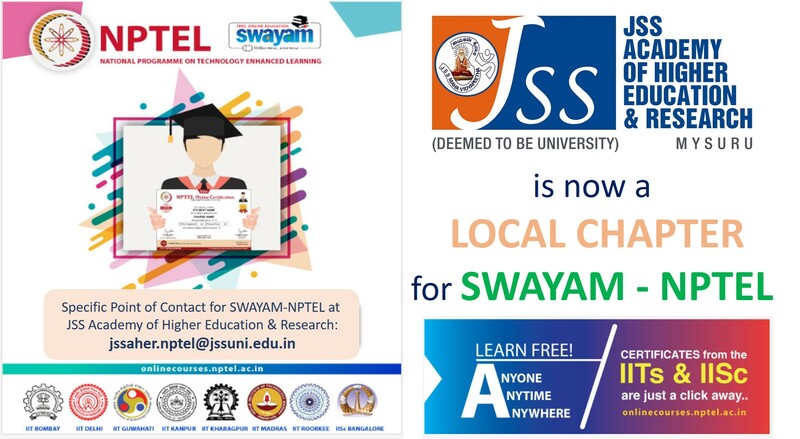 We have developed an IT framework called JSSUOnline (www.jssuonline.com) supporting active learning and pedagogical innovations. This is also one of the green initiatives of the university to realize the objective of paperless administration. The portal also caters to various needs of the researching faculty, parents of the students and the staff of the University. With this system, learning and monitoring becomes easier and efficient. Most importantly, Student-student and staff-student communication is greatly facilitated by this technology. Through this system, we are now able to deliver educational resources to our students anywhere, anytime and on any computing device. Every student undergoing the course and parents are provided with a unique user IDs. Upon logging into the website, the capabilities are available to the students. Parents can also effectively monitor the progress of their ward as the information is available on everyday basis. JSSU Online is envisaged to provide a host of capabilities around educational resource delivery in a phased manner as part of our IT Roadmap. JSS Academy welcomes and synergistically supports the digital learning initiation of the Govt. of India. A wide range of the different specialty courses are available on SWAYAM. UGC MOOCS - A Vertical of SWAYAM, is an instrument for self-actualisation providing opportunities for a life-long learning. Here learner can choose from hundreds of courses. Royal College of Physicians, Edinburgh (RCPE) has set up its international webstreaming centre at JSS Medical College, JSSAHER. It was recently inaugurated by Dr KR Dhakshaini, Principal, MMC&RI. Inaugurating the webstreaming centre, Dr KR Dhakshaini, appreciated JSSAHER for having taken the initiative to establish RCPE international webstreaming centre which will go a long way in helping the medical students of Mysuru to get the best of the educational events that are conducted in the Royal college at their doorstep. She said Royal College, Edinburgh is one of the premier instituitions in UK which sets up the standards for medical students and faculty. Dr PA Kushalappa, Director, Academics, JSSAHER who presided over the programme wanted the students to get the benefits of the many educational initiatives taken by JSSAHER. Earlier Dr M Suresh Babu, Deputy Director, JSS Hospital and a fellow of RCPE in his welcome address said JSSAHER is one of the sixty RCPE international webstreaming sites established across the world by the Royal College of Physicians, Edinburgh. RCPE provides certificates and awards credit points for the participants in the webstreaming centre. Dr MN Suma, Vice Principal, JSSMC, Dr Prshanth S, Asst director, Academic division, JSSAHER were present on the occasion.